Students create paintings from their own imaginations. 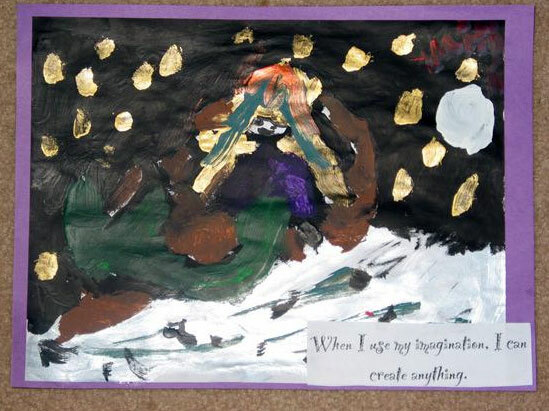 Talk to students about using their imaginations to create paintings. Explain that their imagination is the best tool that they have to create any kind of artwork. Have them wake up their imaginations (I had them close their eyes and say “wake up imagination, wake up”). You may use any creative way to get them excited about using their imaginations. After all of that has been completed they may begin. Don’t tell them what they can or cannot paint, just “turn them loose”- so to speak- to create their paintings. It’s so interesting to see just what they really are capable of. When all is said and done, and the paintings are dry, they can glue them onto the paper for their artbook, and then glue the tag that goes with it (When I use my imagination, I can create anything).Make sure their names and dates are on the back. You have successfully completed page 7 of the art book. Some images are courtesy of Teach a Fish Homeschool.